Julia was born in Berkeley County and has lived here all her life. 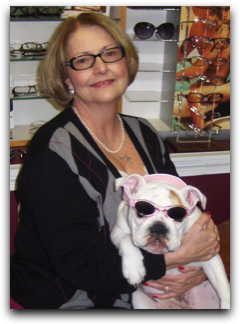 She attended St. Joseph's Catholic School and Shepherd University and began her career in optics with Martinsburg Optical, Inc. in 1973. She has enjoyed 38 years of serving the people of Martinsburg, Berkeley County and the surrounding areas. She attends Vision Expo yearly to continue her education regarding new and innovative lens technology. She is married to John Small, Jr. and has two sons; Joshua and Justin and an English Bulldog, named Abigail, who works in the office everyday!